Last month myself and 4 other maltese bloggers had a taste of what it feels like to be in an article shown in print instead of our usual cyber articles on the web. 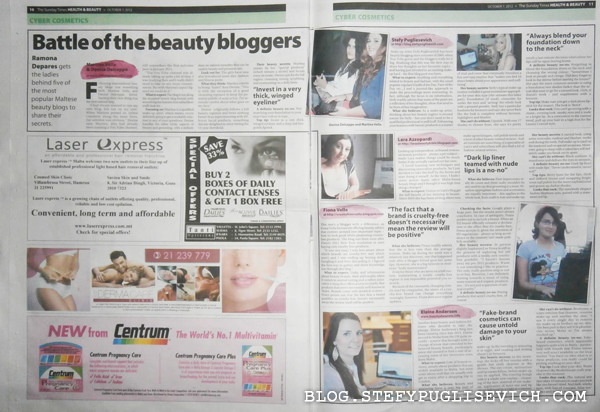 We were chosen to be in a two page spread in the beauty supplement of the Sunday Times of Malta on the 7th October 2012. I decided to add the content here for you all to have a little read. HAVE YOU EVER BEEN FEATURED IN A MAG/PAPER BEFORE? So cool, to have that many people see your article, about you!!! 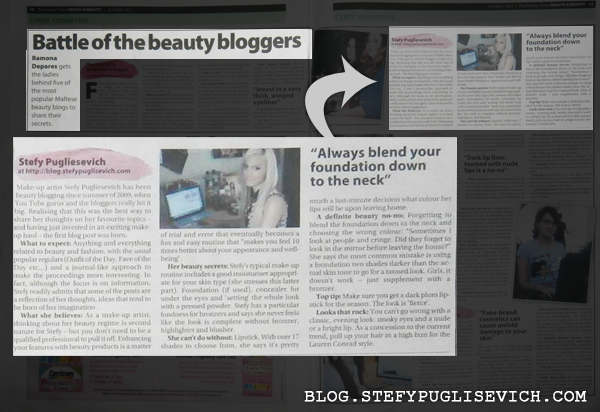 I have been in Vervegirl magazine (a Canadian magazine) but not strictly about my blog. Just discovered you and am now following!!! Would love for you to check out my blog as well! yeah it's great exposure and you feel like youre being heard !